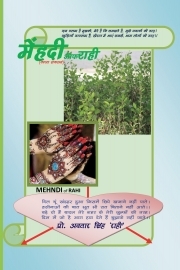 Description of "Mehndi of Rahi"
Dr AVTAR SINGH RAHI has made this poetry when he was in the beginning of his profession. A book "HUMSAFAR" poems of College Life, has already been published. He has many other titles also. He consider life as a light in the dark. And dim light he saw at some distant place, forces him to shape the canvas which according to him is poetry. Reviews of "Mehndi of Rahi"